Who doesn’t love a roast dinner? Come this Easter Sunday, I’m going to be cooking this roast lamb, thanks to a great recipe from Love Our Lamb. I don’t often cook roast lamb, so when I do, it’s a real treat! I love how this is all cooked in one pan, saving on washing up, which is a good thing when all you want to do on a Sunday is have a bit of a chill out day! Just steam some fresh seasonal veggies to go with, and it’s a tasty Easter roast dinner. I’ve been sent the ingredients to make this Easter roast lamb, but as I’m not going to be cooking it till Sunday, I wanted to share the recipe to start with and come back and tell you how I got on with making it. I’m not a fan of fennel, so I will be leaving that ingredient out. I don’t think it’ll hurt the flavour, especially as the dish contains my favourite herb – rosemary – which goes so well with lamb, and I remember my mum always roasting lamb with rosemary. My experience of the recipes from Love Our Lamb, has always been good. Check out the One Pan Roast Lamb, and Herb Roasted Leg of Lamb, that I’ve cooked and shared in the past couple of years, as well as all of my lamb recipes here. Preheat the oven to 200°C, 400°F, Gas 6. Blanch potatoes for 5 minutes. 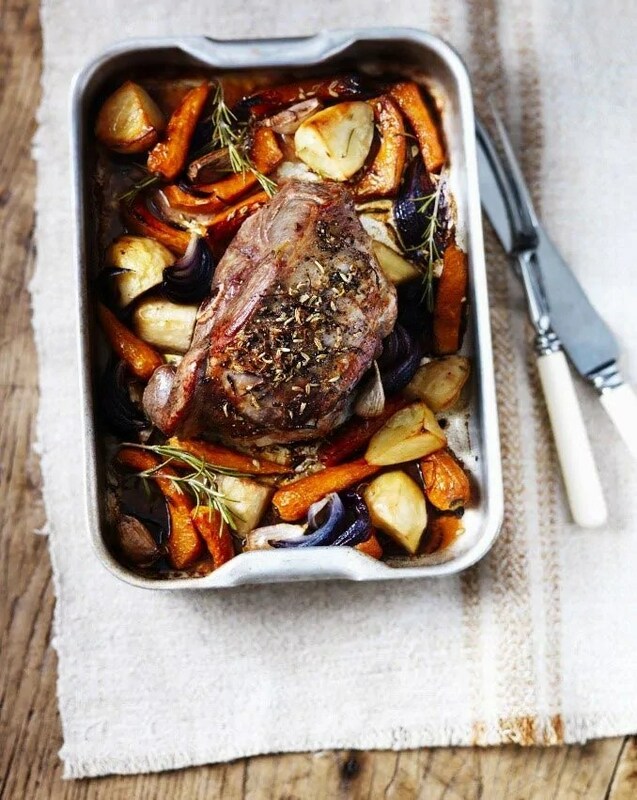 Place the lamb in a large non-stick roasting tin, scatter around the carrots, squash, potatoes and red onions. Drizzle over the oil and season all well. Add a small glass of wine and a splash of water. Place the roasting tin in the oven for 10 minutes and then turn the oven down to 180°C. After another 30 minutes add the garlic and rosemary sprigs to the pan and scatter the fennel seeds and lemon over the lamb. Continue roasting until the vegetables are soft and beginning to caramelise and the lamb is cooked to your liking (approx 20-30 minutes more for medium). Add a splash more wine or water to the pan if it is looking very dry. Once out of the oven cover with foil and rest for 15 minutes before carving. Looks delicious, perfect for Easter! Ooh – this is making me feel hungry! We’re away for Easter but I’ll have to try and check into a pub so we can have some of this. Can’t miss out on the Easter treat!